Motorcyclists are often the most vulnerable people on the road. Based on 2014 crash statistics from the National Highway Traffic Safety Administration (NHTSA), motorcyclists were 27 times more likely to be involved in a fatal collision than other vehicles. One practice that could potentially increase the risk of injury and death in motorcycle accidents is lane splitting. The legal team at Sumner Law has helped a number of clients in Concord, CA and throughout the East Bay following a vehicle collision. We’d like to consider lane splitting as a practice and discuss the risks of this behavior on the road. Lane splitting refers to the practice of a motorcyclist riding between lanes of traffic. A motorcycle may dart between two vehicles while traffic is in motion, or may slip between slower or stopped vehicles as traffic is heavy. That is up for debate. Data on the safety of lane splitting is currently limited, though the NHTSA wants to do more research since it’s a common practice around the world. A 2015 study from UC Berkeley found that lane splitting can be relatively safe so long as traffic is traveling at 50 mph or slower, and the motorcyclist does not exceed the flow of surrounding traffic by more than 15 mph. Yes. In fact, California is the only state in America in which motorcyclists can engage in lane splitting. In all other states, motorcyclists would be subject to fines and other potential penalties if they are caught splitting lanes. While legal and possibly safe in certain circumstances, lane splitting opens motorcyclists up to a whole host of dangers. When a motorcyclist is lane splitting, he or she could wind up in a vehicle’s blindspot. In these cases, a negligent motorist may not notice the motorcyclist and collide with the motorcycle on its side. This can result in loss of vehicle control and catastrophic injuries, especially at higher speeds. Even if you are lane splitting in slow traffic, there are a number of hazards to consider. Motorists changing lanes, merging, or making turns may not notice your motorcycle coming up, resulting in collisions. You may also wind up hitting side mirrors or getting doored by inattentive motorists in standstill traffic. As the UC Berkeley study noted, lane splitting is safest when vehicles are traveling less than 50 mph. At highway speeds, lane splitting becomes a much more dangerous action. A crash at highway speeds can lead to potentially fatal injuries. If you are lane splitting beside a large truck, the dangers of this action are even higher. Not only is there is a risk of being lost in the large vehicle’s blindspot, you could wind up being run over or run off the road. 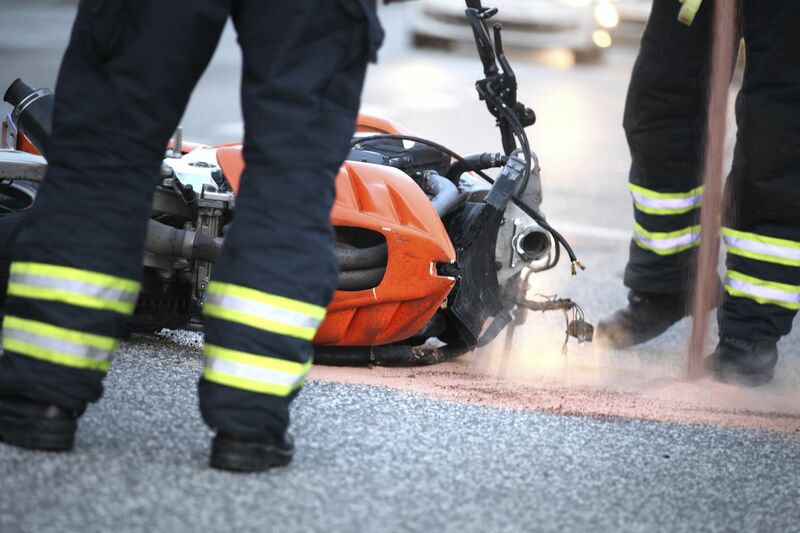 For more information about your legal rights and options following a motorcycle accident, be sure to contact an experiended injury accident lawyer. The team at Sumner Law is here to help you in your time of legal need.